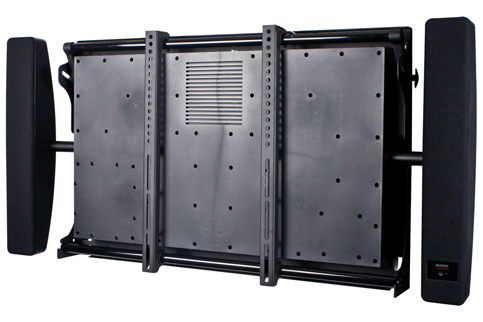 The Audio Solutions™ 2.1 Audio Mount™ System is an upgrade for flat-screen televisions that gives the user dynamic, room filling stereo sound with some real bass. Our 2.1 Audio Mount™ was designed to give you superior sound quality over a wide range of frequencies and works with your TV’s Analog or Digital Toslink™ PCM Audio outputs. With the ability to adjust the speakers and mount up to 15 degrees, the Audio Mount™ generates acoustically tuned sound that will blow your television speakers away. The system is comprised of stereo acoustically designed speakers and a 6.5” subwoofer, along with a built-in 100 Watt Max Class D amplifier. The speakers are set up in a MTM (midrange-tweeter-midrange) configuration, which eliminates vertical lobing in the vocal range. The 19mm silk dome is a high quality tweeter comparable to those found in $500-$1000 bookshelf speakers, delivering low distortion and smooth, extended frequency response of well past 20kHz. The dual mid bass drivers also give great performance in the 100-300Hz range, producing great male voice quality. The speakers are independently adjustable. The subwoofer is a custom 6.5" woofer with a combination of high excursion and very shallow overall depth. It is loaded into a patented acoustic manifold that increases efficiency, reduces distortion, and controls cone motion for high impact, high output bass. The cabinet is optimally vented for increased low bass output, with a port tuned specifically for low air noise and low acoustic compression at high SPL. This subwoofer system is tuned for solid, punchy low end bass. Our Audio Mounts™ offer a clutter-free way to incorporate an upgrade to your audio experience and are extremely easy to install. These systems come complete with mounting hardware, as well as a wide range of television mounting hardware to accommodate most flat panel televisions. These unique systems can be attached directly to the wall using the included hardware or used with one of our accessory mounts for a more custom installation. Analog Stereo RCA: Use Stereo RCA Cables to connect the TV or other audio source to the stereo input on the TV Audio Mount™. Headphone (3.5mm): Use a 3.5mm to Stereo RCA Cable to connect the TV or other audio source to the stereo input on the TV Audio Mount™. Digital Toslink™ Optical: Use a Toslink™ Optical Cable to connect the TV or other audio source to the Toslink™ optical input on the TV Audio Mount™. (Please note that to use the digital input, a PCM signal is required from the TV or audio source.) If you do not have the above output connections or are unable to switch from Bitstream to PCM from your audio source, you will need a Digital Audio Converter. Audio Mounts™ have two modes of operation: Normal and Hearing Impaired. When in Normal mode, the LED illuminates green and the system is set to Normal frequency response. In Hearing Impaired mode, the LED Illuminates blue the audio is enhanced to improve the clarity of voice frequencies. Press the button on the Audio Mount™ remote control to select the preferred operating mode. This button is a toggle and will change between the modes each time it’s pressed. We have no downloads available for the Audio Solutions 2.1 Audio Mount at this time.